Re: What bike next ? Nice bit of kit, loved the engine lumpy and torquey , instant pull, I gave up worrying much about what gear I was in, you can feel the vibes but they are not obtrusive. 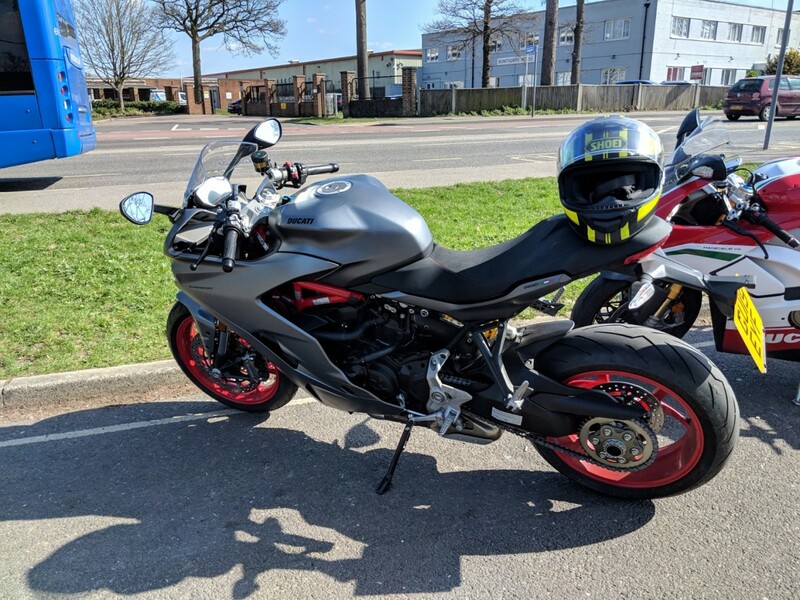 Definitely a sportsbike with more weight on the wrists but not enough to be a pain unless you spend a lot of time in traffic. Perhaps a little heavier than the ST and weight a bit higher I am a shorty at 5ft6" and I felt confident with low speed handling/moving. Rock stable and easy to lean into the corners more confidently than the ST (with my very limited skills) suspension firm and well controlled but a bit harsh on poor roads but there is lots of adjustment so this might be dialled out. Fairing keeps the blast off pretty well and on good roads I found myself 10-15mph higher than on the ST. Economy not wonderful 44mpg not going too mad on busy road, more importantly light came on at 113miles, filled with 12.3l at 122 miles, supposedly 16 litre tanks so maybe 150-160 range with a smidge left. Mirrors are pretty crap, no idea what was directly behind me and above 50mph they vibe like hell and become a guide only. Really high quality bit of kit (except mirrors) and personally I loved the Silver/Grey satin with red frame, bit pricey though. Interesting report Harry. 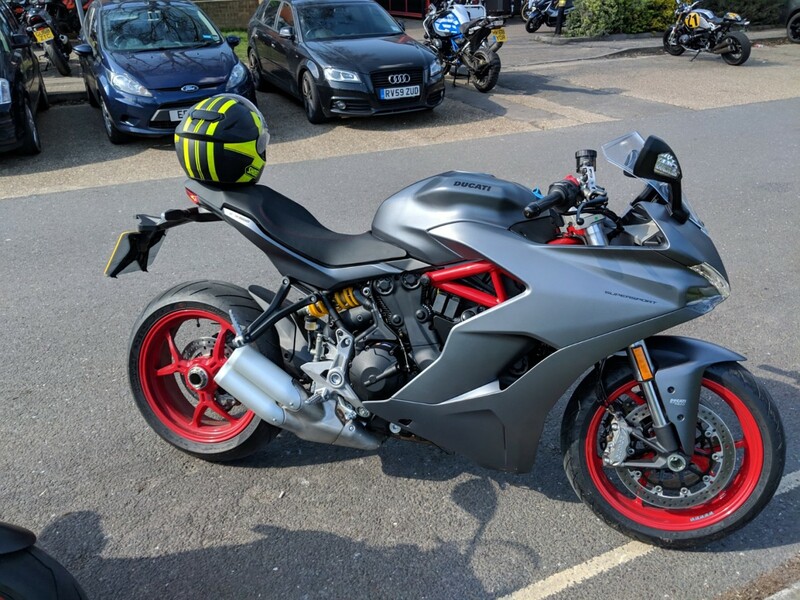 I'm not looking for a new bike but having had supersport 600s (100ish BHP with full fairing) I have been thinking the Ducati Supersport could be an interesting ride, especially for those of us not quite so interested in folding ourselves up to get on a bike these days! Haven't ridden one yet but I did think they looked good where most other full faired bikes are either fat "GT" things or mental track weapons aimed at 20-somethings with flash, cash, and no creaky knees and backs! I didn't know they did that grey colour, I have only seen the red one. I'm not naturally drawn to red bikes but hey it's a Ducati and it looked fantastic in red, what can I say? I was very tempted by an S which was white with red wheels , was a lovely thing but too much money . 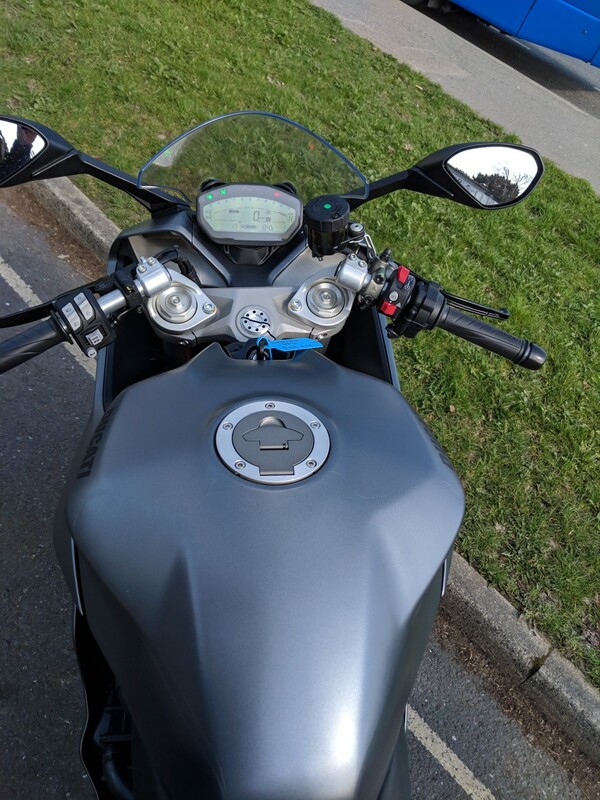 If anyone's looking for a new and/or 2nd bike thats different to a S/triple I'd recommend one of Triumph's new Speed Twins. It might look like a boring retro but I can assure you it's not. Definitely a wolf in sheep's clothing. Stonking engine & nimble handling. Ridden enthusiastically quite capable of embarrassing a few bikes with more sporting pretensions. I rode one of these a few weeks ago and loved it. If I could afford two bikes this would be my second. After 3 Streets. I'm looking at a Speed next. Maybe 2011 or 2010 version. I have to agree with those who have proposed the Speed Twin. I test rode one a few weeks ago, and it has stump-pulling torque. Open the throttle at any RPM, and it surges away on a sea of torque - intoxicating. If I was trading in my 675 Srtipler I'd love the Thruxton - I loved it when they loaned me one when my Stripler was in for a service.